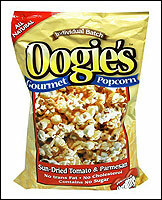 Oogie's Gourmet Popcorn - Ooooooo, Oogie. If we didn't have insane fantasies about your Sun-Dried Tomato & Parmesan popcorn, we'd completely ignore your existence. After all, each 1-oz. serving contains 142 calories and 7g of fat. But this stuff is simply too good to ignore, and we hear Oogie's is MINUTES away from offering single-serving size bags of their gourmet popcorn, which will make portion control that much easier. Hurry up, will ya?! LesserEvil - These guys whip up all-natural, fancy KettleCorn that'll knock your popcorn-lovin' socks off. Our fave of all is their Black&White, which pairs up LesserEvil's famous kettle corn kernels with ones coated in a sweet cocoa glaze. Yum! Each cup of the stuff will cost you 120 calories and 2g of fat. Not too bad...and SO worth it. 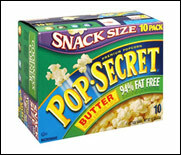 One large, butter-soaked, movie theater popcorn contains more than 1,500 calories and over 115 grams of fat! Even if you skip the butter, that tub'll cost you around 1,150 calories and 75 grams of fat. Today, October 5th, is National Apple Betty Day. Celebrate with this apple pie sub instead! Having mail issues? Click here for a printable, text-only version of this email. And click here for an HTML version.